Liz Magor will lead an open discussion centered around six questions that are designed to probe ways of proceeding in the studio, psychologically and materially, that valorize the weak and un-masterful aspects of art-making. Each question will be prefaced with a context and reference, in effect providing a partial point of view to launch a discussion pertaining to each question. The goal is to get a glimpse of the territory that opens up when we abandon or alter the idea of “power” in art. 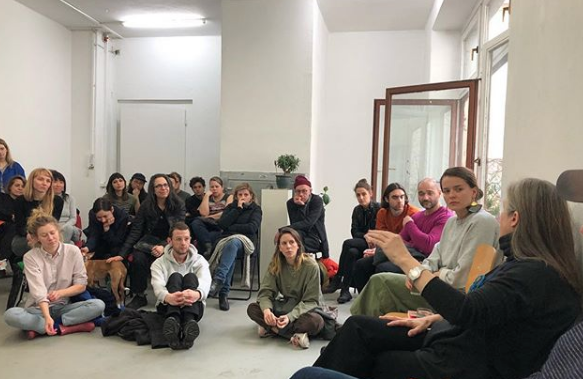 Studio Sunday is conceived as an intimate setting for an evening of exchange, in which to share ideas, discuss themes in contemporary art, and encourage mutual familiarity between the many artists and thinkers working in Berlin. The semi-privacy of ateliers, amongst various works in progress, provides an intimate setting for dialogue and a casual yet critical environment for productive sharing. The collaborative reading and discussion is in keeping with the community based and non-authoritative ethos of the series.